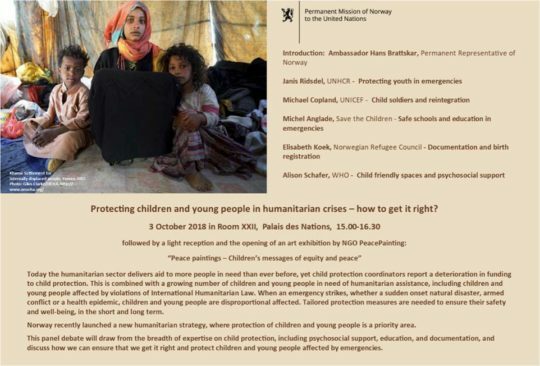 Norway in Geneva, Permanent Missions to the UN and WTO/EFTA invitation to the panel discussion on child protection in emergencies and the opening of the exhibition Peacepainting - Children´s messages for equity and peace. "I encourage you all to take a good look at the paintings that are displayed here today, read the texts that accompany them and to take their messages with you, as you proceed with your work here at the Palais des Nations, in Geneva, and in your home countries. Let us cast light onto injustice and create for it, an exit door."